Vancouver Farmers Markets feed people and create community. We support small farm production, nourish people and connect neighbours. 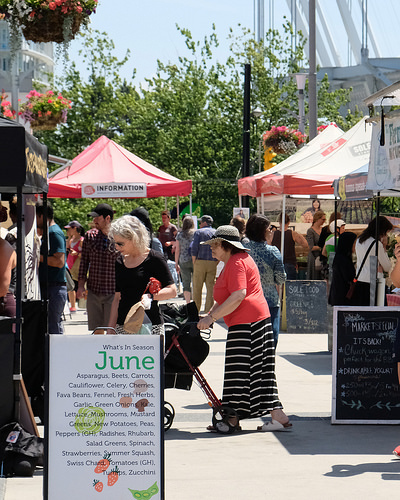 Founded in 1995 as a non-profit society, Vancouver Farmers Markets (VFM) has grown to become one of Canada’s leading farmers market organizations with nine weekly markets, 47o,000 shoppers per year, and annual vendor sales of $10 million. We run farmers markets in Vancouver all year round, including seven weekly summer markets and two weekly winter markets in neighbourhoods across the city. Our farms and producers offer fresh fruits and vegetables, meat, eggs, dairy, and poultry, sustainable seafood, craft beer, wine and spirits, artisan food products, handmade craft, wild harvested foods, and hot food and coffee. We help low income families access fresh, healthy food from our vendors through the Fresh to Families Project, and work with local chefs source market-fresh products for their menus through VFM Direct. When you shop at a Vancouver Farmers Market, you’re not just buying fresh, delicious food directly from local producers – you’re also contributing more than $15 million in direct and indirect benefits to the local and regional economy. Our markets support 280 small BC farmer and artisan food and craft makers, and help keep 3,400 acres of local farmland in sustainable food production each year. Vancouver Farmers Markets is part of a global movement that’s reconnecting people with the land and the people who grow their food. At every one of our nine markets, you’ll meet – in person – the farmers, bakers, artisans, and producers who grow and prepare the foods you love. Read more about the work we do in our community – view VFM’s Social & Community Impact Fact Sheet here. Read more about the benefits our markets have on the local economy – view VFM’s Economic Fact Sheet here.